Why is it so hard to integrate telemedicine into EHRs? This white paper is a composition of a four part series of articles written by C. Rich Abbruscato in early 2018 that provides insight into just why so many organizations are struggling to integrate telemedicine into EHRs. With over 20 years in telemedicine, C. R. (Rich) Abbruscato is one of the pioneers in the telemedicine market. He is founder of RNK Products (using the brand Telehealth Technologies) a company dedicated to the design, development and manufacture of telemedicine medical devices (most notably real-time stethoscopes) and telemedicine systems. Rich is a Guest Contributor for EHRGuide.org. In this white paper, Rich helps the reader better understand the question that integrators ask themselves of “which EHR”? Then he goes on to explain “what not to do”. Learn about a sensible approach for a telemedicine-to-EHR interface and how FHIR Lite Integration for Home Telemedicine (LIHT) may finally be the breakthrough that the telehealth and EHR industry has been looking for. 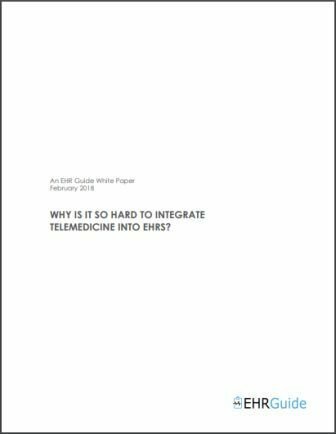 White Paper: Why is it so hard to integrate telemedicine into EHRs? Why is it so Hard to Integrate Telemedicine into EHRs? Part 4 What is the skinny on Practice Fusion charging?